Bedford Eye Care News: Retina-Damaging Green Laser Pointers Easy To Get Online. Retina-Damaging Green Laser Pointers Easy To Get Online. So far, the reports have been scattered and anecdotal. But eye doctors around the world are warning that recent cases of teenagers who suffered eye damage while playing with high-powered green laser pointers are likely to be just the first of many. 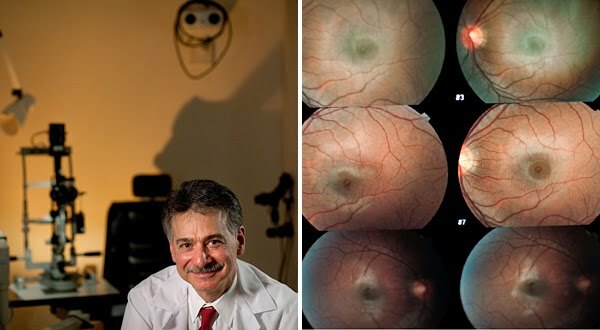 “I am certain that this is the beginning of a trend,” said Dr. Martin Schmid, a Swiss ophthalmologist who reported one such case last September in The New England Journal of Medicine. The pointers, which have also been implicated in a ninefold increase over five years in reports of lasers’ being aimed at airplanes, are easier than ever to order online, doctors say — even though they are 10 to 20 times as powerful as the legal limit set by the Food and Drug Administration. At the American Academy of Ophthalmology, a spokeswoman said the group was unaware of any increase in eye injuries caused by lasers. But doctors interviewed for this article said they were shocked by the easy availability of high-powered lasers. Dr. Josephberg said that at first he doubted the story. “I didn’t believe that a green laser was out there that could cause the damage,” he said. But it turned out the laser put out 50 milliwatts of power, 10 times the F.D.A. limit. And as he investigated his patient’s case, Dr. Josephberg went online and bought a 100-milliwatt pointer for $28. He could hardly believe how easy it was. “I kept waiting for the error message telling me I could not complete the purchase,” he said. Like household lights, lasers are measured in watts, but the similarity ends there. A 100-watt incandescent bulb produces about five watts of visible light; the five-milliwatt laser is only one-thousandth as powerful. But because the light from a bulb is diffuse and a laser beam is concentrated, the effect of five milliwatts on the eye is 10,000 times as intense, according to Samuel M. Goldwasser, a laser expert and author of the online guide Sam’s Laser FAQ. Dr. Jerald A. Bovino of the American Retina Foundation says the way the eye focuses can also intensify the laser. “It is going to the fovea, the center of the retina,” he said. The darker pigment in the fovea absorbs the light as heat, quickly raising the temperature of the retina the same way a black car seat gets hot as it absorbs the sun. Dr. Kimia Ziahosseini of the St. Paul’s Eye Unit at Royal Liverpool University Hospital in England says the dangers are so acute that even the F.D.A.’s five-milliwatt limit is too high. Daniel Hewett, a health promotion officer at the agency, said by e-mail, “There are many noncompliant products available for purchase from retailers, importers and, of course, via the Internet.” He noted that the agency had seized products from Wicked Lasers, an online store based in Hong Kong. Steve Liu, chief executive of Wicked Lasers, said in an interview that its products did not violate the F.D.A. restrictions because those over the five-milliwatt limit were not called pointers. Moreover, he added, “we make it extremely clear on our Web pages that these lasers are not only eye hazards but fire hazards.” And he said the company would begin offering laser safety lessons to its customers before online checkout. Several laser experts say the enforcement of regulations is already insufficient and ineffective. “It’s a whole can of worms,” Dr. Goldwasser said, recalling that he recently received a 100-milliwatt laser as a gift from Wicked Lasers. To rein in all the hazardous products out there — from virtual stores to flea markets — would be impossible, he said. And any talk of restricting availability is certain to meet resistance from the large community of laser enthusiasts, including those who use them professionally (like contractors and astronomers) and hobbyists like 18-year-old Alex Triano of Staten Island. The laser injuries Dr. Shepard Bryan has seen at his practice in Mesa, Ariz., involved red lasers, which laser fans like Mr. Triano consider passé. Green is more easily perceived by the eye and the beam is visible along its path. An article on Tuesday about eye doctors’ warnings of hazards from high-powered green laser pointers sold on the Internet misstated the given name of the chief executive of Wicked Lasers, who said his company’s products did not violate Food and Drug Administration restrictions because they are not called pointers. He is Steve Liu, not Sam. An article on Tuesday about eye doctors’ warnings of hazards from high-powered green laser pointers misstated part of the name of the physicians’ association whose spokeswoman said it was unaware of any increase in eye injuries caused by lasers. It is the American Academy of Ophthalmology, not the American Association of Ophthalmologists. The apparent brightness of a spot from a laser beam depends not only on the optical power of the laser and the reflectivity of the surface, but also on the chromatic response of the human eye. For the same optical power, the green laser will seem brighter than other colors because the human eye is most sensitive at low light levels in the green region of the spectrum (wavelength 520–570 nm). Sensitivity decreases for redder or bluer wavelengths.